Hesitation marks or tentative cuts or trial wounds: They are cuts which are multiple, small and superficial often involving only the skin and are seen at the beginning of the incised wound. 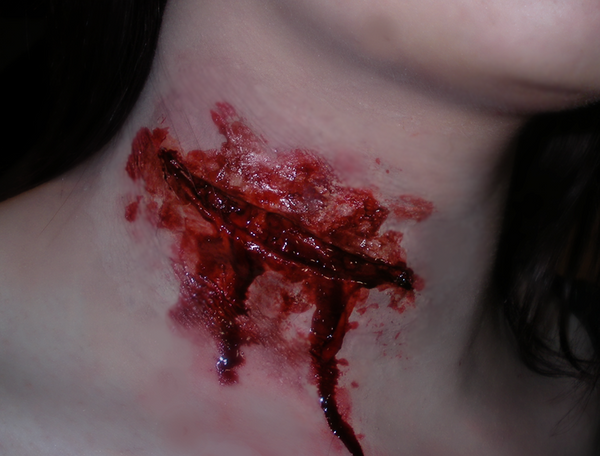 The sites of election of suicidal incised wounds are: Throat, wrist, and front of chest. When preliminary incisions are inflicted with some violence they may be few, but commonly they are superficial and multiple. The fatal incisions are usually made with great violence, and the large gaping wound produced by suicide should not be mistaken for homicidal wounds. When a safety razor blade is used, unintentional cuts are found on the fingers, where the blade has been gripped. Page no:174,Chapter: Mechanical injuries, Forensic Medicine and Toxicology by Dr. K. S. Narayan Reddy/ 29e. Image link : The above image is chosen and displayed from the web. This image do not belong to Gate To Medicine. The author is the responsible owner of the image. We believe that this image is helpful for your learning. Todays Facebook Winner is Ankush Patidar, receiving a FREE Mock Test from GateToMedicine. You need to send us your email id to customercare@gatetomedicine.com. Congratulations!